No folks, this isn’t a joke. 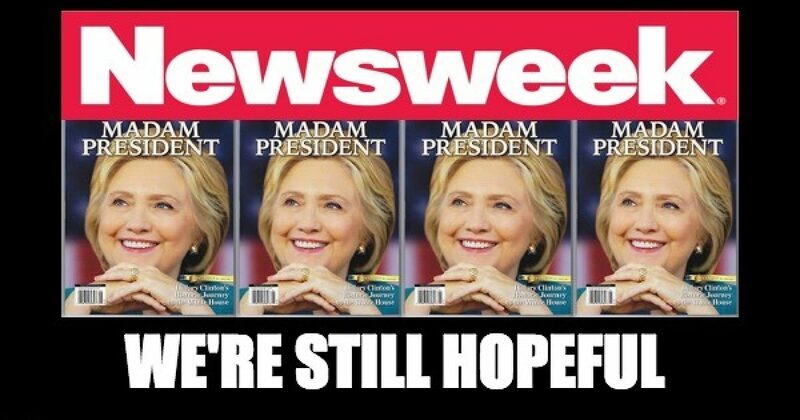 Just short of a year since Donald Trump was inaugurated as president, Newsweek Magazine published an article claiming that it’s still possible for the election to be overturned and Hillary Clinton installed as POTUS. Perhaps they waited until Jan. 18th so they can qualify for next year’s fake news awards. On Wednesday, Lessig told Newsweek this scenario was still a possibility. Sure and there is still a possibility for the NY Jets to be in this year’s Super Bowl, Nancy Pelosi to give “crumbs” from her own pocket to people working for companies not give $1K bonuses, yours truly to grow hair on the top of his head, and CNN’s Jim Acosta to be professional. Since the essay was published, there hasn’t been “any evidence that’s come out that’s resolved the question, whether there was some conspiracy to steal the election,” the professor said. “I don’t feel that we’ve seen anything that increases that probability,” he added. If evidence that Trump and his team conspired to steal the election did emerge in the future, however, the president would have to step down, Lessig maintained. Sorry, but I cannot comprehend a fighter like Pres. Trump resigning. More importantly, from all the information about the investigations seen so far, that will not be necessary. “Absolutely, he’s got to resign, and if he doesn’t resign, then absolutely Congress needs to impeach him,” he said of the hypothetical situation. Here’s the end of that hypothetical situation, after Ryan gives the presidency to Hillary, the DOJ finishes the investigation into the Clinton foundation and pay for play, and she becomes the first sitting president to be tossed in jail. Lessig noted that the hypotheticals he wrote about in his essay would apply to only the specific scenario he described. Obviously, Newsweek believes it was stolen or they wouldn’t have published such an idiotic story. Perhaps it’s time for the once important newsweekly to pull itself out of the darkness and stop lamenting Ms. Clinton’s loss, especially if it wants to hold on to the small audience it still may have.